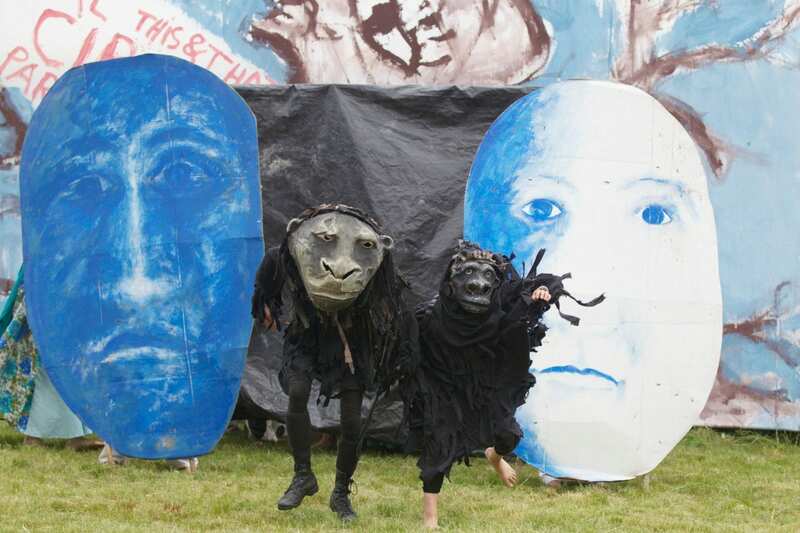 In what has become a new Valentine’s Day tradition, the world-renowned Bread and Puppet Theater will return to Barre’s historic Old Labor Hall, 46 Granite Street, with the premiere of the Total This & That Circus on Saturday, February 14 at 7pm. The Barre Historical Society will also hold a used book sale beginning at 5pm. Bread and Puppet founder Peter Schumann’s famous aioli bread and soup will be served at 6pm. The Total This & That Circus will feature Bread and Puppet’s imaginative mix of the topical, the fanciful, the humorous, and the mystical. Accompanied by the Theater’s brass band, Circus acts will include the battle against bringing F-35 fighter planes to Burlington, the miraculous birth of a calf, a giant face trying to see who’s running back and forth between his ears, and some very tall people with wooden legs. There will also be zebras, deer, some very interfering turkeys, and other paper mache puppet animals. Bread and Puppet, which celebrated its 50th anniversary in 2013, began on New York City’s Lower East Side before moving to Goddard College in 1970 and then to its current home in Glover in 1975. A fixture at peace and other demonstrations since its inception, Bread & Puppet has toured the world while continuing to participate in local Vermont parades and events. The book sale will include approximately 2,500 books donated by John Bloch, of Montpelier. Bloch’s collection features books on progressive economics, politics, and civil rights as well as sociology, agriculture and gardening, fiction, and classics. Both the Circus and book sale will benefit the Barre Historical Society and Old Labor Hall. Admission to the Total This & That Circus is $10. Children under 12 will be admitted for free. For reservations and more information go to https://oldlaborhall.com/ or call 485-4554. The Hall also has a Facebook page: www.facebook.com/OldLaborHall.